Want unmatched soccer fitness? Feel like your fitness training up to this point has been missing that little extra something? Whether it's aerobic (longer runs) or anaerobic (shorter sprints) training you're looking for, you'll find pro workouts you can't find anywhere else. If you're reading this with chip crumbs on your shirt and slowly sinking in to an oreo induced coma I'm afraid we can't help you. 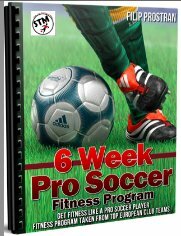 If you are ready to take your fitness to the professional level this 6 Week Soccer Professional Fitness Program is a must. Now you've got no excuse, you have the workouts and guidance along with the motivation and passion you provide to get yourself soccer fit and ready for the challenges ahead. The most common thing I explain to aspiring players about playing at the pro level is the speed of play. Not only how quick the ball moves but how quick players move and work for the entire training session and match. This is attributed to their preparation and high level of fitness, so if you have dreams of playing at Wembley then your fitness better be ready. 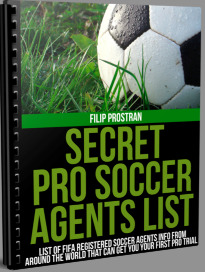 Fitness is just one piece of the pie in soccer but it is the aspect that you have complete control of and you don't need anybody else to raise your soccer fitness to a professional level. Put in the time and you will see the results, you are better off sitting on you couch if you are not going to push yourself every workout that you do, constantly striving for more each day. Taken from professional European club grounds and national championship winning collegiate sides, these specific training methods are for the complete player. Should I Be Doing Long Distance Running or Short Sprints? Well let's think about it logically, during a match do you run long or short? or both? Generally it's quick short burst and sprints for no more than 15 yards at a time, with the occasional 50 yard sprint. So what you should be doing is using the 80/20 rule in this case. The bulk of your fitness training (80%) should be shorter anaerobic (that means shorter explosive sprints, impressed with my fancy words aren't you?). The 20% is left for soccer fitness of longer distances such as fartleks (word made you giggle didn't it?) and for long cool down runs. When I prepare for a season ahead I like to ease into my intense sprint oriented workouts. So i'll start off with a long job throwing in some 10 second periods of picking up the pace every now and again. I don't like jumping right into the hard sprints to avoid injury etc. So once you feel your legs have got that jump back in them I would move onto the 80/20 rule I mentioned above. So the answer is both really but remember not to overextend your self too early. Unless preseason is in a week, in that case I hope you're on a treadmill while reading this. One sprint and you're already gasping for air? But I ran all summer I just haven't done much for the past few weeks. Sorry to break it to you but fitness in soccer is not a one time shot but a continual process, any small break can really make its mark on your game fitness. Soccer is filled with things you can't control on and off the field but one thing you can always control is your level or preparation and a large part of that is your fitness. Whether you need to be fit now or later a lot of getting ready for a season with fitness is all about timing. Too much too soon can get you into trouble especially if you have issues maintaing it year round. When it comes to trials with a new team or pre-season with an existing team, coming in with a high level of fitness can really send a message to your teammates/coaches about your level of commitment and desire to succeed in the upcoming season. As we all know nothing in the game works when you're not fit. We've all been in those games where you're praying that a plane crashes into the field, anything to stop that pain in your chest and legs. You can have all the talent in the world but when you're not fit, what good are you then? All you're doing out there is killing grass. "You need two things to be successful in football, fitness and focus."